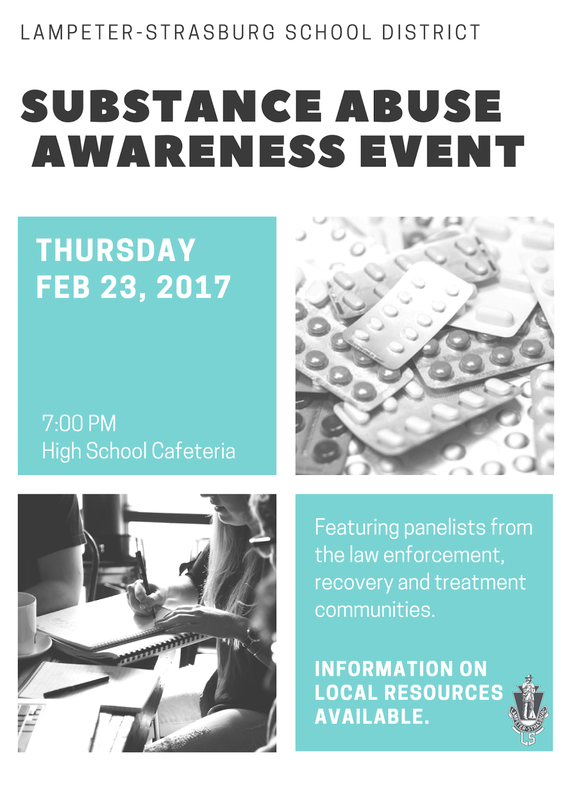 In conjunction with the Lancaster District Attorney’s office, Lampeter-Strasburg High School will be presenting a Substance Abuse and Awareness assembly for all high school students on Thursday, February 23, 2017. The students will hear from two different presenters regarding their experiences with substance abuse, recovery, and the opioid epidemic that has seen nationwide growth in recent years. The presentation is designed to give students new information and perspectives from individuals who have been close to the current substance abuse issues. The students will attend the presentation in grade level groups, and they will have opportunities to ask questions of the presenters at the end of each session. Additionally, the presenters will be available during all lunch periods to have small group conversations with students, and school guidance counselors will be available to talk with students throughout the day. The school day presentation will provide opportunities for students to begin to discuss the realities of substance abuse in our community. The conversations will continue on the evening of February 23, 2017, with a community Substance Abuse Awareness Event. The event will be held in the high school’s cafeteria beginning at 7:00 pm. Panelists from the District Attorney’s office, the Lancaster County Drug Taskforce, and Empowering for Life - an addiction treatment and recovery agency - will present valuable information about the current challenges in our local community and engage with the audience in a question and answer session. Representatives from approximately a dozen agencies will be on hand before and after the presentation to speak with attendees and provide information. The event is free and open to the public. We encourage you to attend this event to learn valuable information for the continued health, safety, and well-being of your child. Unfortunately, this crisis is impacting our community at an alarming rate. It is our hope that the information everyone receives will support the continuation of meaningful dialogue regarding this serious matter. We look forward to seeing you at this important event.